Rajasthan has always welcomed everyone with open arms to explore its architecture, mythology, and beauty. Udaipur amongst all is always a must on the checklist when it comes to Rajasthan. This Holi in Udaipur all you need to do is planning your trip there for these reasons. Holi is one of the famous festivals of India and there are various types of Holi celebrated across the country. So celebrate your this Holi in Udaipur and enjoy the warm hospitality of Rangeelo Rajasthan. This City of Palaces and Lakes is the royal destination of India. And doubtlessly, there is a grand two-day royal celebration of Holi festival in the palace with the descendants of the royal family. The royal family would light the bonfire and it would be followed by the fellow people taking rounds around Holika Dahan. Apart from this, there is also a royal dinner with the traditional mouth licking delicacies. The other day is celebrated with colors and water balloons and flowers all over the city in the alleys and palaces. Not only this, there’s one more significant reason to keep Udaipur on the top in your Holi 2019 checklist. The colors used here are natural colors which are made by the tribal women living around Udaipur. Interesting, right? A record states that 1100 kilos of natural colors are made by the tribal women which helps them to earn a good amount of livelihood. A day prior to Holi there’s a celebration as Mewar Holika Dahan where the bonfire takes place at the City Palace. 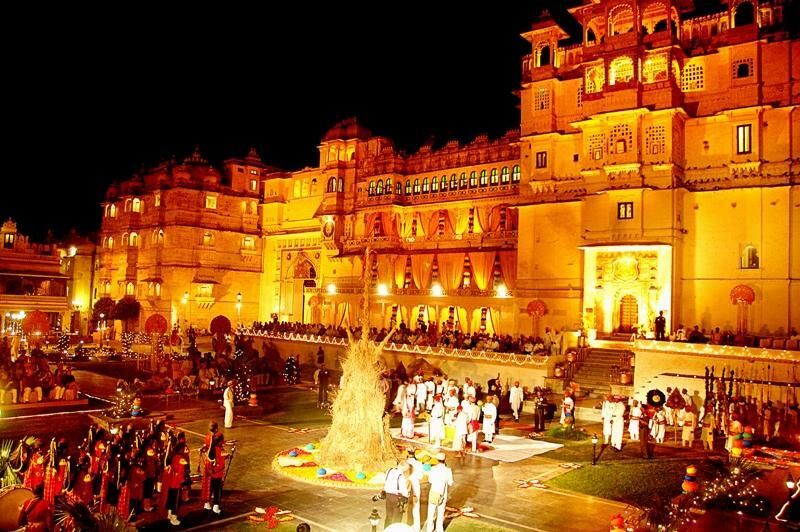 City Palace is the best place to see the royal celebration of Holi in Udaipur. Around this bonfire, the folk dance is performed which is just eye-pleasing. Alike Mathura and Vrindavan, in Udaipur also the celebrations are in full swing a week ago. Gandhara or Gangakund is believed to be the most auspicious lake with the presence of the holy river Ganga where devotees start gathering in advance. Encumbered temples are decorated and have special preparations for Holi. There are traditional meals with chats and regional dances and what not. There are decorated processions of horses, camels, and elephants around the city. 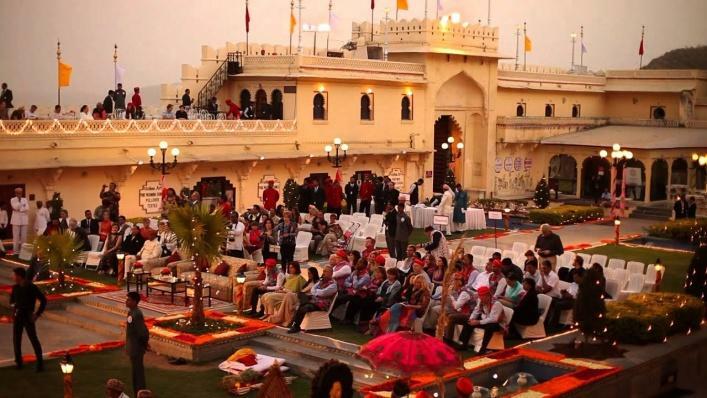 On one hand, the Holi event is celebrated in the most royal and authentic way in the palaces. While, on the other hand, there are numerous villas and resorts offering customized parties. The list includes Udaipur Holi Festival, Labgarh Holi Festival, Udaipur Tomatina Holi Festival, Yaro Di Holi and a lot more. Ranging from a nominal charge of 200 INR to lacs, there are villas and parties for every budget. So, in a nutshell, Rangeelo Rajasthan is really Rangeelo during Holi celebration and you’ll regret your entire life if you’ll miss this chance. Holi 2018 was a thing in the past, but you have Holi 2019 approaches. 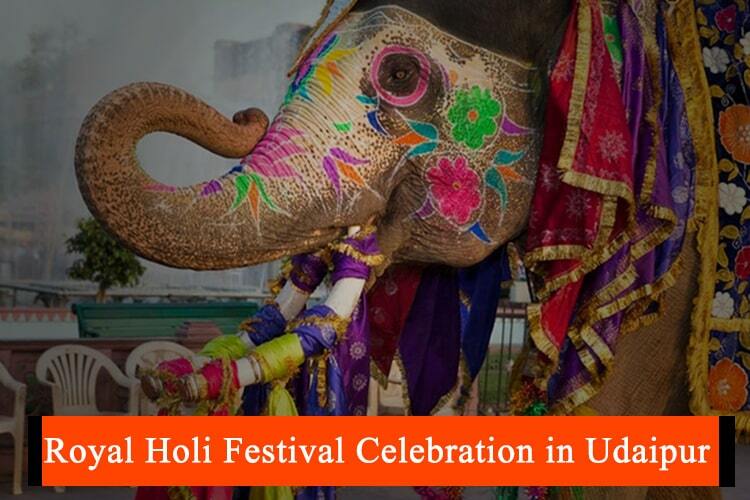 So buckle up your belts and plan your trip to celebrate this Holi in Udaipur.